Guided Inquiry is an innovative team approach to teaching and learning where teachers and school librarians, with other experts and specialists, join together to design and implement inquiry learning. It engages children in constructing personal knowledge while using a wide range of sources of information and creatively sharing their learning their fellow students in an inquiry community. Guided Inquiry Design is grounded in the research of the Information Search Process (ISP) that describes students’ process of learning from a variety of information sources in extensive research projects. The ISP research goes inside the inquiry process to reveal ways to guide students in deep engaging learning. For many years I have been conducting research on the process of learning from a variety of sources of information (Kuhlthau 1985, 2004, 2005). The second edition of Seeking Meaning (2004) is a good summary of this work. My studies opened insights into students’ perspective of their experience in research projects. I investigated students’ feelings as well as their thoughts and actions while they were in the stages of learning from various sources of information described in my model of the Information Search Process (ISP). What is too often thought to be a simple report or a routine term paper assignment was found to be a complex inquiry process that requires guidance, instruction, and assistance for optimal learning for every child. In these studies I investigated students’ thoughts, feelings and actions while they were involved in extensive research projects. I found that they progress through six identifiable stages, which I named for the main task to accomplish in each stage, plus a seventh assessment stage. These studies showed that students’ thoughts are charged with emotions that influence the actions they take. Students experience a dip in confidence and an increase in uncertainty when they least expect it, during the Exploration stage. They often expect to be able to simply collect information and complete the assignment. 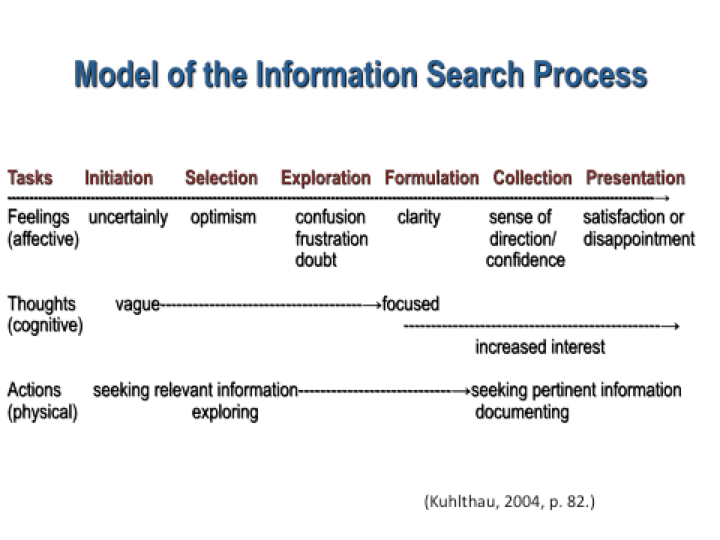 This simple view of the research process sets up stumbling blocks, especially in the Exploration and Formulation stages. When their expectations do not match what they are experiencing, they become confused, anxious and frustrated. The early stages of the ISP reveal the struggle they experience in learning in an extensive inquiry project. Feelings are important and indicate when they are having difficulty and when they are doing well on their own (Kuhlthau, 2004). Let’s take a closer look at each stage in the ISP and what it tells us about guiding inquiry. Students often feel apprehensive and uncertain about what is expected of them and overwhelmed at the amount of work ahead. Talking with classmates is a natural action to take, but some feel they should be “going it alone” and that checking with others might not be “entirely fair.” It is important to make sure that students understand that it is not only fair to talk about their ideas and questions, it is necessary to have these conversations at this stage to begin to get their thinking going. Many students want to select a specific topic or question quickly and dive right into collecting information and completing the assignment. This is where students can go astray right at the beginning. They need lots of groundwork before they can form meaningful questions that they want to pursue and that are worth investigating. Selection is a time for introducing and expanding on the general topic to be researched. In preparation for forming important questions, students need to build background knowledge on the general topic and to discover interesting ideas. A common problem is that many students skip over the Exploration and Formulation stages and attempt to move on to the Collection stage without having formed a focus for their research. For most students, the Exploration stage is the most difficult in the research process. As they browse information about their topics, they become confused by ideas that don’t fit together. They encounter inconsistencies and incompatibilities of different perspectives and differing points of view. They have difficulty determining importance from everything in a text. They need to understand that there are different kinds of reading for different stages in their learning process. At this stage they are exploring for interesting ideas rather than collecting detailed information. They need to learn to browse through a variety of texts, skimming and scanning to get a general picture. They need to recognize when to slow down and read to gain sufficient background knowledge and to pick up interesting ideas. Exploration is best achieved by jotting down interesting ideas from a variety of sources rather than taking extensive, detailed notes from one text. Students need support, structure, and strategies for learning from different sources of information to assimilate new ideas and form a focused question from the ideas that arise in their explorations. Formulating a focus marks the turning point of the ISP when students identify a focus, an area of concentration, “something to center on,” and clarify their research question. Once they have formulated a focus for their research, their feelings of uncertainty and confusion begin to diminish and confidence increases. It is important to note that forming a focused question comes at the midpoint of the ISP not at the beginning as often expected. A good focus is one in which ideas continue to grow and evolve based on thorough reading of information and detailed note taking in the Collection stage. Students assume a “study” frame of mind of concentrated attention. A clear focus enables students to determine importance in what they are reading. It helps them to discriminate between less significant facts and more important ideas. A good focus can be adapted and altered as they continue to learn while they read, write and collect information. Interest in the project deepens as students get further along in constructing an understanding of their focused question. The Presentation stage marks the beginning of the writing process that introduces another set of challenges. Students who construct their ideas as they collect information are better prepared for writing and creatively presenting what they have learned. They experience fewer writing blocks because they have been constructing their learning all the way through the research process. These students often express a sense of accomplishment and satisfaction in what they have learned and created. Students that merely collect facts in a “cut and paste” fashion have difficulty preparing an original presentation and often express disappointment and boredom with their inquiry project. The ISP has become one of the standard models of information seeking behavior and one of the most highly cited in the field. Over the years the ISP research has changed the way many librarians and teachers help students with project-based learning. It has opened a window into what students are experiencing when they are constructing new understandings and learning from multiple sources in the dynamic information environment. It has revealed ways to guide students in their learning. Students need considerable guidance and intervention in learning throughout the inquiry process in order to construct personal understanding. Without guidance, they tend to expect a simple collecting and presenting assignment that leads to copying and pasting with little real learning. With guidance, they are able to construct new understanding in the stages of the ISP and gain personal knowledge and transferable skills in learning from a wide variety of information sources. 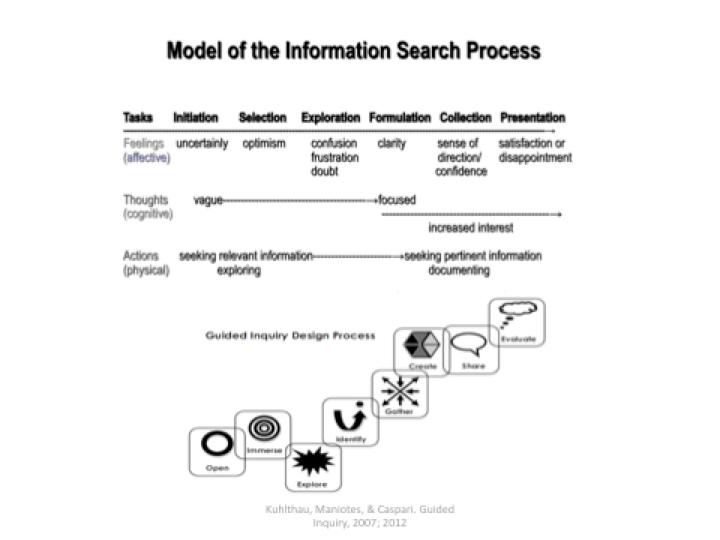 The ISP model describes what students’ experience in the phases of the inquiry process. These studies provide solid evidence on how to guide learning in the inquiry process that prepares students for learning, living and working in the information age. The Guided Inquiry Design framework is built around the ISP with specific direction for guiding students in each phase of the inquiry process. Guided Inquiry opens the inquiry process at Initiation, immerses students in background knowledge at Selection, guides in exploring interesting ideas at Exploration, enables identifying an inquiry question at Formulation, supports gathering to address the question at Collection, intervenes for creating and sharing at Preparation, and assesses throughout the inquiry process and evaluates at the close. Let’s take a closer look the Guided Inquiry Design Framework. The Guided Inquiry Design process begins with Open the inquiry to catch students’ attention, get them thinking, and help them make connections with their world outside of school. Next is Immerse, which is designed to build enough background knowledge to generate some interesting ideas to investigate. Then Explore those ideas for an important, authentic engaging inquiry question. Next, pause to Identify and clearly articulate the inquiry question before moving on to Gather information. After gathering, Create and Share what students have learned and then Evaluate to reflect on content and process and assess achievement of learning. The shape of the Guided Inquiry Design Process follows the flow of confidence and interest of students in the inquiry process that will help you guide students in reading to learn. This is a general framework for designing an inquiry approach across all curriculum subjects for students of all ages. Think of inquiry as a way of learning in the information age school, not simply as an occasional research assignment. Now let’s look at each phase in the inquiry process and think about how to design student learning in each phase. Open is the invitation to inquiry at the beginning of the inquiry process. It is a distinct and important phase of the process that sets the tone and direction of the inquiry. Once the learning team has decided on the learning goals, they need to create a powerful opener that invites the learners in and introduces the general topic to engage all of the students. The main goal is to open students’ minds and stimulate curiosity and inspire them to want to pursue the inquiry. The opener is designed to spark conversations and stimulate students to think about the overall content of the inquiry and to connect with what they already know from their experience and personal knowledge. It sets the stage for learning. In the Immerse phase, the students build background knowledge together through an immersion experience. The learning team designs engaging ways for students to immerse in the overall ideas of the curriculum area under study, for example reading a book, story, or article together; viewing a video; or visiting a museum, a field site, or an expert. The main task of Immerse is to guide students to connect with the overall content and to discover interesting ideas that they want to explore further. As they build background knowledge together, each student reflects on ideas that matter to him or her and are worth further reading and investigation. In the Explore phase of Guided Inquiry, students browse through various sources of information exploring interesting ideas to prepare to develop their inquiry question. The learning team guides students to apply the reading strategies of browsing and scanning a variety of sources. Students dip into a few texts to read lightly in order to make sense of the information they find and to raise lots of questions. “Dipping in” is a reading strategy that enables students to go further into interesting ideas without becoming overwhelmed by a multitude of specific facts. Students can easily become overwhelmed by all the information and confused by facts that don’t fit together. The learning team guides them to keep an open mind as they explore and reflect on new information they are encountering and to begin to find questions that seem particularly important to them. Guiding students through the Explore phase leads them to form a meaningful inquiry question. In the Identify phase learners pause in the inquiry process to develop a meaningful inquiry question and form a focus. In Guided Inquiry they have had lots of preparation for this phase. Students are ready to identify an important question for their inquiry because of the time they have spent immersing and exploring to build enough background knowledge to ask meaningful questions. The main task of the Identify phase is to construct an inquiry question from the interesting ideas, pressing problems and emerging themes they have explored in various sources of information. The team introduces strategies that enable each student to think through information and ideas to clearly articulate a focused question that will frame the rest of their inquiry. A clearly articulated question gives direction for the Gather phase. Gather sessions are designed to help students collect detailed information from a variety of sources. In this way they are learning to determine importance in what they are concentrating on in their reading, listening and observing. The learning team guides students in locating, evaluating and using information that leads to deep learning. The main task of the Gather phase is for students to choose what is personally meaningful and compelling about their inquiry question in the information sources they find and reflect upon. The learning team guides students in a structured approach for managing their search and documenting what they are learning. First students “go broad” to find a range of sources that are useful for understanding their inquiry question. Next students “go deep,” by choosing a core of the most useful sources to read closely and reflect with sustained attention as they find connections and gain personal understanding. After students have thoughtfully gathered enough information to construct their own understandings of their inquiry question, they are ready to organize their learning into a creative presentation during the Create phase. Creating a way to communicate what they have learned about their inquiry requires students to articulate what is most important about their subject and enables them to integrate their ideas more firmly into deep understanding. The learning team guides students to go beyond simple fact finding and reporting and to summarize, interpret and extend the meaning of what they have found and create a way to share what they have learned. Create sessions are designed to guide students to reflect on all they have learned about their inquiry question and decide what type of presentation will best represent their ideas for a particular audience. The learning team guides students in creating a meaningful, interesting, clearly articulated, well-documented presentation that tells the story of what they have learned. Share is the culminating phase in the inquiry process when students share the product they have created to show what they have learned. Students have become experts on the question for their inquiry community. They now have the opportunity and responsibility to share their insights with their fellow students and communicate their learning to others. Their inquiry products may be shared with a wider audience, such as their parents or another group of students in their school or in another school, perhaps online. An important component of Guided Inquiry is the collaborative learning that takes place when students share what they have learned in the inquiry process. The Evaluate phase, which occurs at the close of the inquiry process, is an integral part of Guided Inquiry. Although Guided Inquiry incorporates assessment for determining student progress throughout all of the phases of the inquiry process, evaluation occurs at the end when the learning team evaluates students’ achievement of the learning goals. In addition, the learning team guides students in reflection for self-assessment of their content learning and their progress through the inquiry process. Students’ self-reflection takes place while the entire process is fresh in their minds to reinforce content learning and establish good habits and competencies for learning and literacy. Competency in using all kinds of information for clear, deep understanding is essential for every child in today’s world. Guided Inquiry provides opportunities for children to learn strategies in locating, evaluating and using a wide range of media and a variety of texts and puts all of their strategies and skills into action throughout the inquiry process. Starting at youngest age, children are introduced to inquiry as a way to learn that prepares them for living and working in the information age. As students continue through the elementary and middle school and on to high school Guided Inquiry creates an environment that motivates them to want to learn. It engages them in determining importance and meaning by connecting the curriculum with their world for deep lasting learning. The Guided Inquiry Design framework is an innovative, dynamic approach to teaching and learning for providing information age education for children across the United States and in countries around the world. Kuhlthau, Carol, Leslie Maniotes and Ann Caspari. Guided Inquiry: Learning in the 21st Century, Libraries Unlimited, 2007. Kuhlthau, Carol, Leslie Maniotes and Ann Caspari. 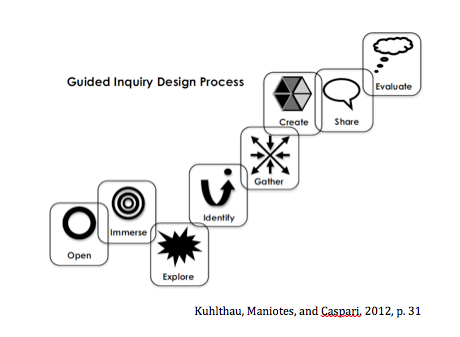 Guided Inquiry Design: A Framework for Inquiry in your School, Libraries Unlimited, 2012. Kuhlthau, Carol. Seeking Meaning: A Process Approach to Library and Information Services, 2nd ed. Libraries Unlimited, 2004. Kuhlthau, Carol. Teaching the Library Research Process, Scarecrow Press, 1985. Todd, R., Kuhlthau, C. C., and Heinstrom, J. 2005. Impact of School Libraries on Student Learning. Institute of Museum and Library Services (IMLS) Leadership Grant Project Report http://cissl.rutgers.edu.